As providers of service and insurance to PEO’s, small and medium-sized businesses are the “bread and butter” of clients targeted. Property/casualty insurance experts may not agree on everything but there is a consensus that the most important emerging risk for the industry remains the five-letter word: CYBER. It is not new, of course, but it stays atop emerging risk lists because of its dynamic and pervasive nature. Insurance Journal defines emerging risks as those that are new and not yet widely recognized, or perhaps recognized but not well understood. A number of industry leaders explain why cyber remains such an important risk to watch. The biggest risks involve cyber crime. Under “emerging risks,” one of the biggest is the Internet of Things (IoT), and the cybersecurity risks created by billions of interconnected devices. The challenges for agents and brokers multiply in regard to understanding the potential implications, such as IoT devices in homes and businesses — tracking sensors, fire/flooding/intrusion warning devices and more. Agents need to be aware of the questions to ask clients to ensure they are offering complete coverages. They need to be vigilant in keeping up with the IoT devices emerging at an astonishing pace. — Robert Rusbuldt, CEO, Big “I” Independent Insurance Agents & Brokers of America. One definite area of emerging peril is the threat of substantial property destruction caused by intrusions into sensitive computer networks and connected hardware devices. Long gone are the days where the worst aspect of cyber vulnerabilities amounted to stolen credit card information or lost privacy. Instead, a new breed of cyber exposure is unfolding whereby energy infrastructure facilities and other industrial works have been targeted with cyber attacks causing explosions, wreckage and business interruption. Most expect these risks will soon expand to domestic infrastructure and transportation operations with the prospect of major instances of property damage and life-threatening injuries. Insurers and reinsurers could underestimate non-affirmative cyber exposure leading to an unplanned shock from a major event. Non-affirmative cyber exposure occurs when a cyber attack causes major losses by triggering coverages in other classes. Data are of insufficient quality, are incomplete and/or lack the necessary consistency for more advanced modeling techniques. Governments predominantly fail to provide frameworks for the sharing of large- scale cyber-terrorism-losses. In the younger group, 62 percent said they’d be happy for insurers to use third-party data from the likes of Facebook, fitness apps and smart-home devices to lower prices, according to a survey of more than 8,000 consumers globally by Salesforce.com Inc.’s MuleSoft Inc. That drops to 44 percent when the older generations are included. As consumers share more of their personal data online, governments increased their scrutiny of how it’s collected and used following the harvest of 61 millions Facebook users’ accounts by U.K. firm Cambridge Analytica. The European Union’s new privacy law, known as the General Data Protection Rules, took effect on May 25. Of the older generations, 45 percent of 35- to 54-year-olds are happy to allow insurers broad access to their digital identity, while 27 percent of those 55 and older would do so. Insurers are investing millions improving their digital offerings amid growing competition from fintech startups. But that’s a work in progress: 58 percent of the survey’s respondents said that systems don’t work seamlessly for them, with many citing difficulty filling out a form online. And 56 percent said they would switch their insurance provider if digital service is poor. From both sides off the table (agent and underwriter) there is still much more to learn in this burgeoning insurance product line which has increased premiums written 35% in the last two years. Warren Buffett said he doesn’t want Berkshire Hathaway Inc. being a leader on cyber insurance because neither he nor others in the industry really know the risk. Buffett said that cyber risk is part of his estimate that every year carries about a 2 percent chance of a super catastrophe that would cause $400 billion or more of insured losses. While that kind of disaster will wipe out many companies, Berkshire will aim to keep its exposure low enough to remain profitable in such a year, the 87-year-old chairman said. Buffett said he’s fine with writing some cyber policies to remain competitive, but doesn’t want to be among the top three in the industry. Anyone who claims to know the base case or worst case for losses is “kidding themselves,” he said. [Property/casualty insurers wrote $1.35 billion in direct written premium for cyber insurance in 2016, a 35 percent jump from 2015, according to reports by Fitch Ratings and A.M. Best. According to the reports, the largest cyber insurance writers are American International Group, XL Group and Chubb. These companies had a combined market share of approximately 40 percent at year-end 2016. The top 15 writers of cyber held approximately 83 percent of the market in 2016. As an fyi, NAPEO has formed a Cybersecurity Task Force to better understand the exposures of PEO and how to mitigate them. A very timely and critical task force that I am very proud to be a part of – This is by far the most misunderstood exposure to PEO today. 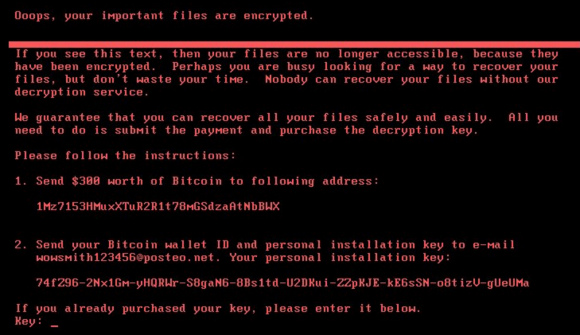 Does your company have a process in place to combat and/or react to a ransomware attack? If not, you should. The below article published on krebsonsecurity.com outlines one of the newest ransomware threats. Unfortunately, cybercrime isn’t going anywhere anytime soon. Below is a brief update from the FBI on the topic. Losses from cyber crimes rose 24 percent in 2016 to over $1.33 billion, according to a report by the Federal Bureau of Investigation’s Internet Crime Complaint Center (IC3). Cyber Insurance is quite possibly one of the most discussed and equally misunderstood concepts over the past several years. If you own a business, you must ensure you are protected from cybercrime. Libertate Insurance has access to several markets one of which is a new PEO Cyber Master program. Contact us today for more information.